New Delhi: Jaypee Hospital, a multi super specialty hospital in Sector 128, Noida, won a prestigious award in the category ‘Emerging health brand of the year’. 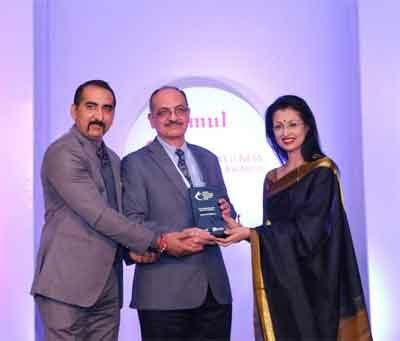 The awards were organised by the India Healthcare & Wellness Summit & Awards – 3rd annual edition at Hotel Taj Palace, New Delhi. The award was received by Dr. Manoj Luthra, CEO, Jaypee Hospital by the leading film and T.V. actress Gautmi Tadimalla. Dr. Luthra also participated in a panel discussion on ‘Relooking at the basics of healthcare.’ It was a whole day event which included panel discussions and sessions addressed by industry veterans and leaders highlighting the trends prevalent in the healthcare sector. “The healthcare sector gives us an opportunity to serve the people in need and we are honoured that our hospital is being recognised for all the good work we have done for the society,” he added. The foundation of Jaypee Hospital was laid two years back in 2014 and in the past two years the hospital has treated more than 2 lakh patients. Recently, Jaypee Hospital has successfully completed more than 110 liver & renal transplants in a year. The hospital continuously strives towards achieving its vision of promoting world-class healthcare amongst the masses by providing quality and affordable medical care with commitment.